Skin is so various when it comes to colors and types, from the beautiful dark brown to the amazing pale ivory and so many shades in between. Unfortunately, skin problems are typically all the same therefore most skin conditions may happen in all races and all skin types. 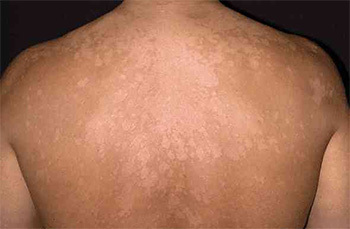 Nevertheless, some skin conditions seem to be more common to the dark skin or to be more severe in the case of dark skin. Additionally, many treatments for regular skin conditions may actually cause other problems in the case of dark skin. In order to know how to take care of your face and body, it’s fundamental that you get to know one or two things about the biology of dark skin. The melanocytes refer to the color of all skin stems from cells and they’re the one producing melanosomes as they’re all packed with the natural chemical melanin. What we’ve learned from research so far is that all people have pretty much the same number of melanocytes in skin tissues, no matter the color of the skin. What separates us from each other is the size and the distribution of the melanosomes. The larger and the more they are, the darker your skin is. Melanin in the skin is responsible for absorbing and scattering energy from the UV light, therefore a dark complexion is going to lower the risk for sun damage, which is the main cause for skin aging and skin cancer formation. The chances for dark skin to develop pigmentation issues are quite high and even a minor skin injury (a bug bite) may cause a slight change in skin pigment, offering the dark spots (hyperpigmentation) the opportunity to happen. If you’re not using the right cosmetic treatment, you may also put yourself at risk for injuring your skin. A dermabrasion, a laser surgery or a wrinkle-filling injection may be the main cause for some severe pigmentation problems. Let’s go over the common skin conditions that black skin may also experience from various reasons. Acne is in fact a frequent problem, no matter the skin type. 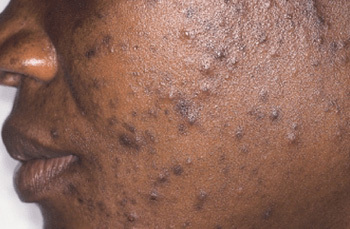 As it’s connected to the hyperpigmentation which is a serious concern for dark skin. The overproduction of oil in the skin is the main cause in acne. The oil is going to combine with bacteria within your pores, blocking the pore openings. An inflammation under your skin is going to appear and it’s only a matter of time until lesions are going to show (from small, unnoticeable bumps to large cysts). A trauma like this is going to lead to pigmentation problems in dark skin and many medications used against acne may do the same thing. Some oral antibiotics (minocycline is very well known for that) may determine a darkening of your skin, taking you several months to heal. When you have dark skin and develop acne, it’s better to talk to a dermatologist as soon as you can so you don’t end up with some permanent pigmentation scars. You may have heard about dermatitis by now, which is a skin condition that includes itchy, red rash that lasts for a long time, as main symptoms. Stress, extreme changes in temperatures, plant allergies, dry skin or irritations determined by cosmetic ingredients and skin care products are the most common reasons for eczema in dark skin. If the eczema is the result of an inherited tendency, we’re going to talk about an atopic dermatitis. It seems that eczema happens in children with dark skin twice as often. It seems that it’s a very common problem in Mexican-American teens, when compared to whites or blacks. It’s going to cause long periods of treatment if it’s misdiagnosed or not treated right. An efficient treatment for eczema is going to include a good identification of the condition and the removal of the products that irritate skin. Some steroid creams and moisturizers may help a lot and even ultraviolet light therapy is a solution in certain situations. Either way, it’s fundamental to get help from the very first signs of red, itchy rashes as you do want to stay away from pigmentation problems. When it comes to hyperpigmentation, whether it’s because the skin produces too much pigment or because the pigment is placed deep within the skin, causing the dark spots. As the color is lost, you’re dealing with hypopigmentation so you’re going to notice light-colored patches all over your skin. People with dark skin are exposed for both skin conditions. The post-inflammatory hyperpigmentation may stand out as the most typical type of pigment condition in dark skin. A skin injury such as scrape, burn or a cut may be the main reason for it. This skin condition may happen together with acne or eczema. It may take years for the darkened area of skin to fade, despite the medical treatments. As for the medical treatments, you may try to remove layers of skin with the help of chemical peel or bleaching treatments. None of these treatments isn’t going to work on pigment deeper in the skin, though. You should use sunscreen so that you make sure that the pigmented area doesn’t get darker. If your skin is sensitive, you present higher risk for pigmentation issues. Truth be told, any skin care product ingredient that dries or irritates your skin is going to raise that risk. The most popular products contain salicylic acid and benzoyl peroxide, whereas the anti-aging products would include retinoid and glycolic acid. Hydroquinone in skin-bleaching products is going to irritate skin in some people too. If your skin is lighter, the moment you stop the products that cause the irritation, the skin condition is going to disappear. For the dark color though, the irritations are going to cause post-inflammatory hyperpigmentation as well. You may have to deal with this type of problem even 2 weeks after you stopped the product, taking you months until you heal for good. Nevertheless, as long as you’re using them right, all of these ingredients are safe and efficient to use on dark complexion. Even though dark skin presents a natural protection against skin cancer, this doesn’t mean the risk for skin cancer is null. It may happen where the skin is lightest (soles of your feet, around the nail bed and in the palms). This situation happens for Native Americans, Asians and people of African descent. 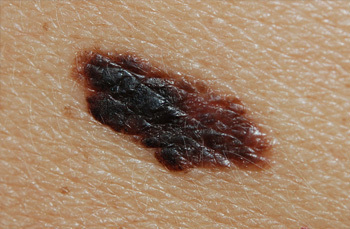 Melanoma is going to appear mostly on the legs in the case of Hispanics. As it’s quite common for melanoma to be misdiagnosed as plantar warts (on the soles of your feet), talon noir (black heel) or tinea manuum (a fungus that appears on the palms of your hands), the treatment isn’t proper so the melanoma death rate is highest among people of darker skin. An early diagnosis and being aware of this skin conditions are the best things to do. 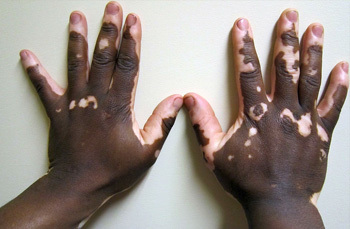 In the case of vitiligo, your skin becomes depigmented. The loss of color leads to white, large patches on your skin. 2% of the population is struggling with vitiligo, which is quite easy to notice in the case of dark skin. Vitiligo appears when melanin-producing cells are damaged, even though there is no certainty about that. Sometimes vitiligo may hit the scalp so the hair may turn white, causing a premature gray hair. A “re-pigment” of the skin may be one of the solution. 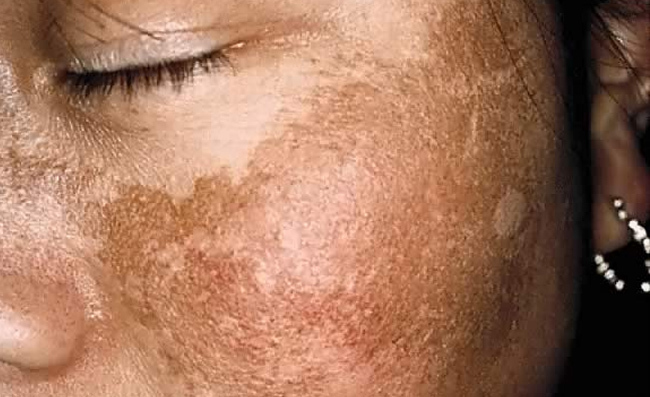 Exposure to UV light (phototherapy) is one way to get rid of vitiligo as you’re increasing the amount of melanocyte cells at your skin’s surface like that. You may also use some topical eczema cream tacrolimus, twice a day. Normal pigmentation may come back, even though you’re going to have to wait a couple of months until you get to see the results. Using some powerful steroid creams on specific areas of your body (face and neck) may work as well. The risk of keloids (a scar that goes over the original injury, developing into a growth) is high every time your dark skin is injured. 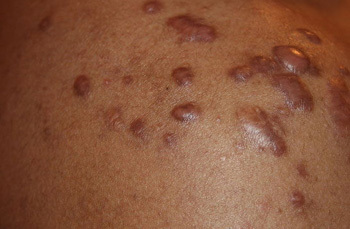 Cuts and burns are the most typical causes for keloids. You would typically develop keloids on your chest, arms, earlobes and back. They may appear right after an injury, but may also need a couple of years to grow. 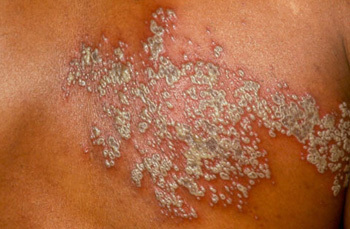 Some people also experience pain, burning and itch when developing keloids. A tenderness to the touch is possible too. We don’t know for sure why keloids develop and some believe they related to a defect in collagen production. As for treatments, radiation therapy, cortisone injections, silicone gel applications, and pressure dressings are the frequent solutions. Some remove keloids with laser or surgery, but no matter the treatment you’re trying, keloids are going to come back in 45% to 100% of the time. Typically misdiagnosed as acne, this skin conditions includes bumps under the surface of your skin as main symptoms. It’s the ingrown hairs that seem to be the problem, though. Hispanic and black people are dealing the most with this type of skin conditions. You don’t want to squeeze or manipulate the bumps in any way, as you may cause inflammation or infections. Laser hair removal is one of the solutions that you could try, but the best thing that you can do is to see a specialist that is going to diagnose it right. Next Next post:Does Hydroquinone Cause Cancer?